Welcome to Tony's Cafe & Pizzeria! Located in the Taneytown Shopping Center in historic Taneytown, Maryland. 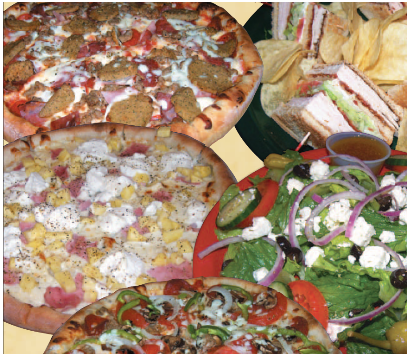 Appetizers, Salads, Soups, Pasta, Platters, Subs, Wings, Sandwiches, Gyros, Sliders, Wraps, Calzones, Stromboli and of course Tony's delicious pizza make for a wide variety of choices when dining with us! Dough is made daily on site at Tony's Cafe for our pizza and handmade sub rolls. Sauces, such as, Alfredo, Pesto, Marsala, White Wine. Scampi and Creamy Rose are created per order! Dine in, Carry out and delivery are available seven days a week. Choose from two seperate dining areas! Family dining or Sports dining! Tony's Cafe has both! Pool Tables, Bar game, Electronic Dartboard, Internet Juke Box, Ten Big Screen TVs to watch your favorite sports! Come Dine With Us! Tony's Cafe is so much more than Pizza! Tony's Cafe & Pizzeria appreciates your business! Happy Hours! Monday thru Friday 2pm to 7pm!